It is a sad reality that our indigenous languages are dying. Our children cannot converse in their mother tongue and I blame no one else but parents for this regrettable trend. The elites especially are guilty of the warped mentality that an inability to speak ones local dialect translates to class! Many times, children are not spoken to in their local languages at home, and most primary schools do not offer any of our local languages as a subject, and so kids of nowadays only get introduced to their first language in secondary school, where it is sometimes even optional and by which time they are less likely to develop sufficient interest to enable them read or write it fluently. Speaking “vernacular” as it is sometimes referred to has become nothing short of a taboo in many homes. Children are being raised to be monolingual. The “ajebutter” syndrome continues to threaten the survival of indigenous languages in Nigeria, which is quite unfortunate as UNESCO and various other studies have shown that contrary to what many believe, children who have their mother tongue as a medium of instruction, and experience English as a subject have higher cognitive development than those who are instructed in English. It shows a classic case of inferiority complex when parents spend thousands of dollars to ensure their wards get a good grasp of European languages but neglect to speak Yoruba, Igbo Or Hausa which comes at no cost to them! After all, most of these kids are not even fluent in English despite it being the only language they speak. Hence, a lose-lose situation. Nowadays, it is considered “razz” to speak any of the local languages to a child talk less of encouraging them to speak it. We send our children to select schools home and abroad in the hope they would ditch their “crude” Nigerian accent for a “more refined and globally acceptable” one. It is a profound reflection of the slave mentality that so easily besets the black man. The irony of it all is that more often than not, the most fluent and eloquent men and women are those who have mastered the art of speaking their mother tongue and English; our lingua franca. The likes of Wole Soyinka and the late Chinua Achebe are known for their oratory prowess in English as well as Yoruba and Igbo respectively. As a matter of fact, studies have shown that children can grow up learning 3 to 4 languages from a very early childhood without getting confused. Where we got the twisted notion that proficiency in an indigenous language will hamper a child’s command of the English language or any other language for that matter beats me! The English, French, Chinese, Spanish and Russians all speak their heritage languages as an official language, even though we may argue that the Nigerian society is more complicated, with over 500 languages – far higher than the number of languages spoken in any of the countries mentioned above. It was expedient that an official language be chosen to facilitate the linguistic and cultural unity of the country, hence the adoption of English, the language of our colonial masters. However, this further stresses the need to ensure that our individual/tribal languages do not go into extinction as they have become increasingly endangered. I remember being tutored in the art of writing Yoruba properly (with the application of tone marks – a prerequisite for the correct pronunciation of words) by my dad even before I gained admission into high school. Before then my siblings and I were always encouraged to speak the language by both parents especially at home. They were cognizant of the fact that we didn’t have the option of learning it in school and so made sure that we were not lacking in that area of education at home. At the end of the day, I am definitely the better for it and proud that I can speak my language fluently (without my English suffering too), thanks to my parents. Any knowledge acquired comes in handy at some point in life. The more languages a person speak, the greater their ability to communicate effectively with people of different tribes, races and tongues. When we encourage our children to learn to speak French and Spanish, let’s be sure that our own Igala, Edo and Calabar heritage languages aren’t taking the back seat. It’s a worthy legacy to bequeath to our children and posterity will thank us for it. P.S: Wishing all the children all around the world who colour our world a very happy children’s day! I agree with you on this matter. Many of us are deluded; my daughter is so polished she cannot speak a word in Yoruba, my wife is away she went to have her baby in the States when you really cannot afford it, my kids go to XYZ school when you pay fees every term is a struggle. As you have pointed out real values passed on to children are free. I pray to do better as a parent. Lol, you’re not alone. Most of the kids I interact with cannot say a word in their languages. It’s sad, but we can correct it before it’s too late. Thanks for commenting Bolaji. God bless you Lolo for this piece. It is now becoming a very big issue and we are ignoring the fact. I will quickly sight some examples about different families aboard and how just one in about ten believe in strengthening this trend. I had this same chat with some of my friends this week. Really I believe the families that oppose the speaking of vernacular silently regret after a while but they just choose to pretend knowing it’s rather too late. Family 1: Brought kids from Nigeria at age 10,8 and 4 they weren’t thought and they don’t understand their native language. Here comes their father trying to tell us a joke that is not funny at all. He said “I was talking to my friend in YORUBA and I put my phone on speaker and the younger child called the attention of her siblings and said ‘shhhhh daddy is talking WEIRD again’ thank God among the three of us listening to his ‘JOKE’ he was the only one laughing and we simply told him the truth. Family 2: Brought daughter from Nigeria 2.5years ago. Initially she understood but she doesn’t anymore. She now barely greets her parents’ friends and if she is forced to……she just says hello from a distance and walk away. I was discussing with her dad and I know he doesn’t like the situation and he said he would eventually send her back for a while but I bet her mum will never agree to that. Family 3: My no nonsense paddy. Brought her kids 2years ago and still beats them like they are in Nigeria. The last time I visited I was shocked…..See spanking….you go fear. And when it comes to that, it is Yoruba ooo even her baby who literarily came in as a ‘baby’ understands what his mum was saying. I must say I was really impressed. She can relate to her kids whenever they are messing up outside. All she says with a smiling face is ‘kuro,joko sibe, jeka de ile wa je egba ‘ and the kids cooperate immediately. Trust me I am not the butty type when it comes to expressing my native language outside.Call me Razz I don’t really care. OYINBOS are craving to learn our language and culture and trust me I have been teaching them. Thank you so much for your elaborate dissection of this subject matter. You’re so right, even foreigners find our fascinating, yet we belittle it. I hope and pray parents learn. Thanks Lola. Quite on point Lolade.I have always been an advocate of all round child training. I communicate with my wards both in English and our mother tongue and I encourage them to do same when communicating with me, even though their yoruba intonation is comic relief for us.. Psycholinguistics even say it helps their intellect and assimilation. Spot on Lola! Children have everything to gain when they can speak as many languages as possible. We should be proud of our mother tongue. Thank you. Well said Lolade,i totally agree with you,i speak both Yoruba and Igbo to my 4yr old daughter and my 1yr Old.I want them to have a broad knowledge of the languages and now my daughter speaks a little yoruba,i wonder why we are throwing our culture away. Wow! Didn’t know you could speak igbo. Way to go with your kids, we really need to preserve our languages. Thanks Kanyinsola. Thanks dear. Amen to your prayers! @ Lolade you are so right and on point. from my personal experience of having parents who had intertribal marriage, I can tell you it has greatly helped us aaa family. My Dad being Yoruba and my MUM being Igbo.they can both now speak each other’s language and we the children can speak both Yoruba and Igbo. I can tell you my ability to speak these languages especially Igbo has earned and is still earning me favours here and der. 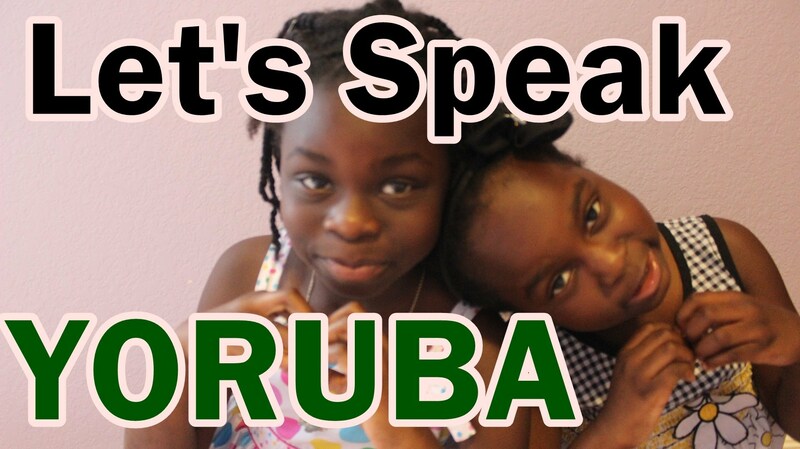 am now teaching my children how to speak Igbo and Yoruba also and it’s real fun. Fantastic to have someone like you share their experience, considering the fact that you can speak 2 major Nigerian languages fluently. Let’s hope the new generation of parents can learn from this. Thanks Funmi.